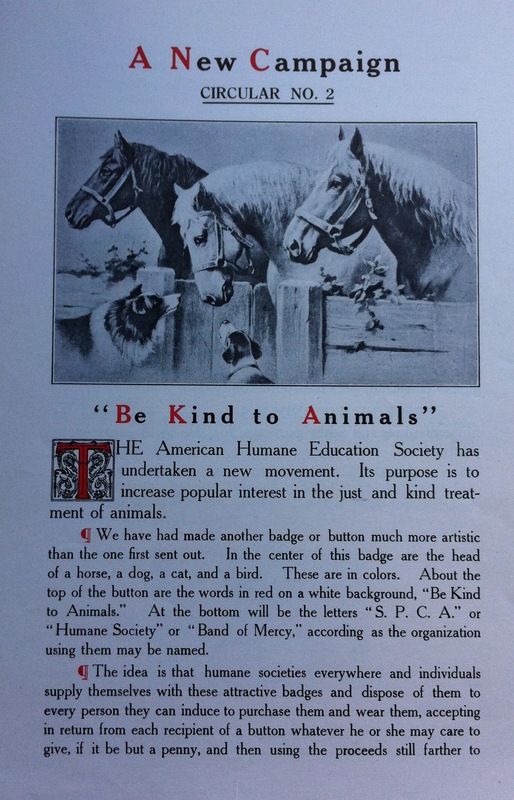 “A New Campaign.” Brochure published by the American Humane Education Society. Any humane society or individual who wanted to purchase the buttons for distribution could do so at a cost of $3 for 500. The AHES noted that this was not a money-making venture for them, rather, that this price covered the cost of producing the buttons as well as the cost of packaging and postage. The AHES saw tremendous potential in this button campaign. In other words, the visibility of this button–in all of the contexts listed above–is what the AHES felt would help make this campaign a success. As this brochure notes, “no one could see a button with its plea “Be Kind to Animals,”™ without at least having his thought called to this claim upon him of all animal life. Thousands who would never see a humane book or leaflet or hear a word said upon this subject would be led to think of their duty.” The “Be Kind to Animals”™ button may have been small in size, but it was given a place of honour in early Humane Education campaigns.